After the grim pessimism of yesterday’s topic, it’s time for something lighter. In the past, I’ve shared lots of libertarian humor, both from a friendly perspective and a critical perspective. Now it’s time to add to that collection. We’ll start with a great video from the folks at Reason. They have a parody trailer for a libertarian version of Star Wars. Excellent job. I’m surprised this video doesn’t already have 100K-plus views. Please share it. The first segment of the video reminds me of the libertarian chicken. Also, for those who may have missed the reference, the “Free to Chewbacca” segment at the end is based on Milton Friedman’s great Free to Choose program. You can see Chewbacca’s part within the first five minutes of Episode One. But you should watch the entire series. Our next video could be considered a follow-up to the Hayek love song I posted five years ago. It warns that faith in government and politicians puts a nation on a road to serfdom (I’ve argued that the VAT does the same thing!). To be sure, the Hayek videos that everyone should watch are the rap versions about his debates with Keynes. Part I and Part II are both superb and very economically sound. Now let’s switch to a short video about shopping in Texas. Sort of reminiscent of this joke about the difference between conservatives, liberals, and Texans. It’s not as good as this classic video mocking gun-free zones, but still worth watching. And you can see other humorous gun control videos here, here, and here. For inexplicable reasons, you can’t actually watch the embedded version of this next video featuring Ron Swanson. You’ll have to click through and watch it on Youtube (at least that’s what I have to do on my computer), but it’s worth that extra step. There’s also another great Ron Swanson at the end of this post, though once again you’ll have to click through and watch it on Youtube. P.S. 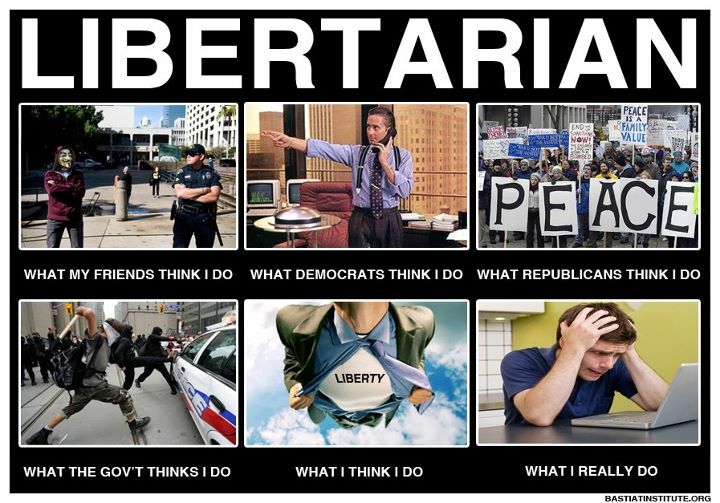 Here’s a different version of the how-the-world-sees-libertarians poster I shared in early 2012. And if you like this type of humor, you’ll enjoy seeing whether you (or libertarians you know) belong in one or more of these 24 categories.